Nearly all of us garden in some form or another. After all, isn’t growing our own food one of the tenets of self-reliance? Besides that, it’s fun, fulfilling, and good exercise. Biting into that first sun-ripened tomato, crisp, sweet carrot, or oh-too-juicy melon makes all that planning and work worthwhile instantly. But as we age, some of the work becomes more difficult and we need to find new ways to do the things that make that garden not only possible but more enjoyable, too. Now that I’m over 70 years old, I think it’s safe to claim that I know a few things about this. 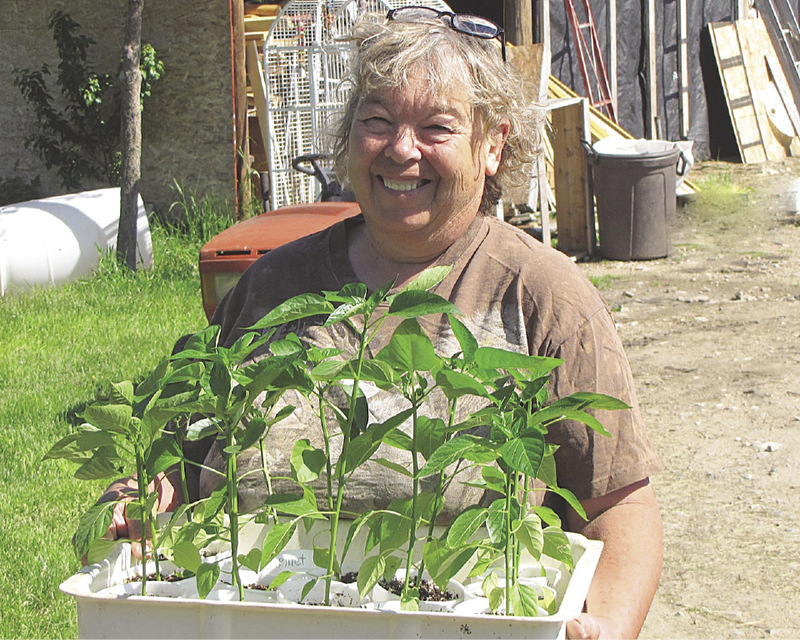 Jackie Clay-Atkinson has been gardening her entire life. Now over 70, she has adapted her methods and overcome many of the physical challenges of continuing to garden. But some tasks are getting a bit more difficult, so instead of quitting, I just try to think of ways to make them easier. There is usually a way to accomplish a task without all the strain it used to take. I used to just take the wheelbarrow down to the garden full of manure, mulch, or whatever, and then back up the steep hill, full of rocks, weeds, or debris. It seems like that hill has gotten steeper and longer and my bad elbow doesn’t seem to like lifting those heavy wheelbarrow handles any more. So instead of the wheelbarrow, I find myself using our riding lawn mower and two-wheeled garden trailer, instead. Not only can I haul, sitting down, but the trailer has a dump box so I don’t have to lift heavy debris out of it, either. And my handy trailer also hauls boxes and buckets of feed, wood shavings, and garden produce from our six big gardens, all with me sitting down. Not so shabby! But the riding lawn mower and trailer won’t fit into some smaller areas, such as when I want to transplant a young fruit tree or a clump of peonies. I’ve found that by using a snow saucer or plastic toboggan in these tighter areas, I can easily slide the unmanageable, heavy item around on the ground with little effort. Another handy way to move heavy things is by using a two-wheeled moving dolly. These little carts are inexpensive and you can use them to move everything imaginable, from railroad ties to refrigerators. I often use them to move 100 pound sacks of feed around the homestead. I used to be able to not only lift, but carry those sacks quite a distance with ease, but that was three compressed vertebrae and a damaged shoulder ago. Now I just drag them out of the back of our Subaru, slip the moving dolly’s “foot” under the sack, and off to the barn we go. As I age, I find myself growing more crops on a trellis. This helps eliminate a lot of bending while tending and harvesting crops. Here are some beans growing on a stock panel trellis. I’ve moved tons of landscaping rock, boulders, bales of straw, and railroad ties for raised beds with mine, and it doesn’t show any wear at all. In the last few years, I’ve found I’m growing more crops on trellises now, instead of in rows or beds on the ground. Reasons for this are pretty much physical. 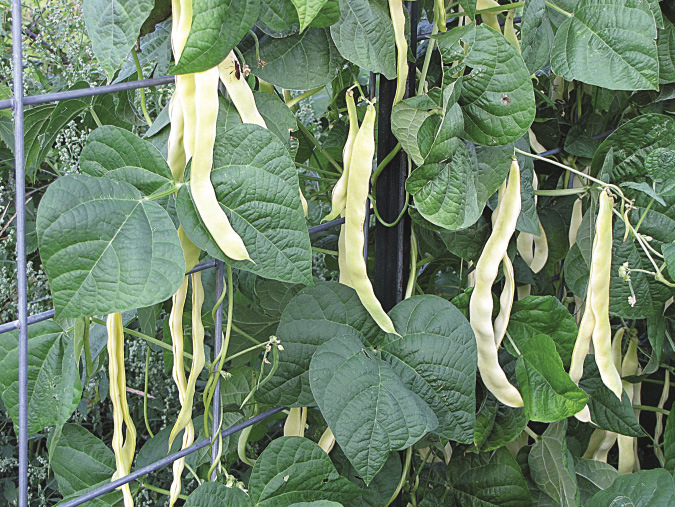 After all, it’s easier to pick pole beans rather than bush beans, and easier to harvest cucumbers hanging from a trellis instead of bending to find them in a bed on the ground. Growing on a trellis also lets you grow more food in a smaller area than when you grow on the ground. It also keeps your vegetables cleaner. 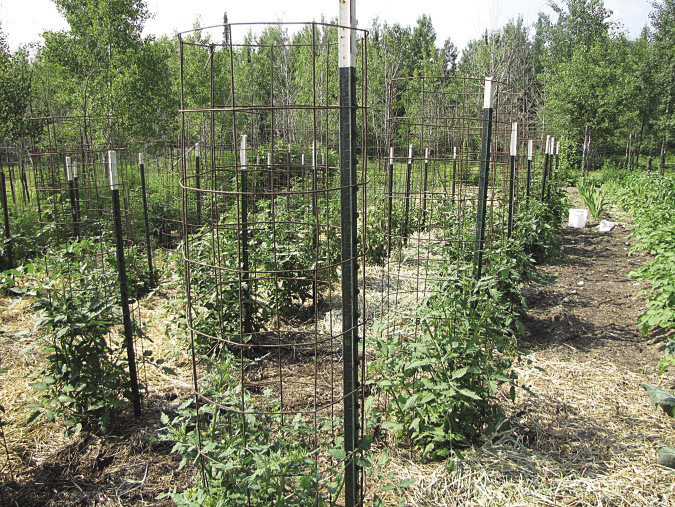 A trellis can be just about anything, but the easiest, strongest, and nicest to handle and pick from are those made of welded livestock panels or “cattle panels.” They are sturdy, not too heavy to handle, easy to cut into shorter lengths with a pair of long-handled bolt cutters, and very easy to attach to steel T posts, driven into the ground every 8 feet or so. I use zip ties for a quick, easy fix, since they’re easy to remove in the fall. Welded wire “cattle panels” are ideal trellises. They can be attached to T posts with zip ties, are sturdy, won’t sag, and can be reused year after year. They come in 16-foot lengths. On these trellises I grow pole beans, cucumbers, melons, peas, and sugar pod peas. The wind will never blow them down, nor will the weight of the crop cause them to lean or sag. Come fall, you just have to cut them loose, remove the old vines, and lean the panels up against the garden fence. I even use them in the berry patch, making an arbor for the grape vines to climb up. I put two 16-foot panels horizontally, ten feet apart where the rows of grapes are, fastening the panels to steel T posts, then hump four more panels up over the row, placing the ends inside the horizontal panels and tying them together with fence wire (zip ties will eventually photo-degrade and break). This makes a very attractive arbor and keeps the grapes up and easy to pick. Just like growing vegetables on a trellis, we have entirely switched to caging our tomatoes. For years I just let them sprawl on the mulch in the garden, but the more tomatoes I grew, the more my back complained about all that bending to pick them. So I started staking them up. That was fine, but required a lot of work, bending to tie the vines to the stakes as they grew taller. I tried about every cage known to man and the results were always the same; the tomatoes would get heavy and tall and a strong wind would eventually blow the cages over, even when a wooden stake was driven in to help hold the cage upright. Tomato cages made from leftover rolls of concrete reinforcing wire are the best we’ve ever used. They keep sprawling tomato plants and their pendulous fruits off the ground and are easy to reach through. By attaching every cage to a T post, they never tip over. Then my husband, Will, began making tomato cages from concrete reinforcing wire. We were given several partial rolls by a friend who just wanted to be rid of it following a construction job on their place. So Will cut lengths so the cages would be about 18 inches in diameter, just folding the wire back on itself to hold the cage together. They are awesome! These cages are easy to pick tomatoes from, as the squares are so large. We solved the problem of the cages blowing over by pounding a steel T post in next to the tomato plant, then sliding the cage down over both the plant and T post. Now we never have a tomato plant tip over, and I can easily harvest tomatoes without creeping along on the ground. One of the best things I’ve found to help me harvest such low crops as bush beans is a simple, lightweight plastic seat which fits inside a plastic bucket. A friend gave me one, and now I wouldn’t garden without it. Sure, you can just turn a five gallon bucket upside down and sit on that, but that raised edge sure cuts into you after a few minutes of sitting. This plastic seat is comfortable and you can sit on it for a long time. The bucket and lid are lightweight, waterproof, and you can vary the height of the seat by choosing the right bucket — some are three and a half gallons, others are five gallons, and a few are six and a half gallons. I like the latter, as it’s taller, and therefore easier to sit down on and get up again. I’ve found these seats at local farm and ranch stores, especially during the winter when folks are ice fishing. A couple of years back I fell off our barn roof. Now my husband doesn’t want me to climb up high any more, but we have a nice orchard of fruit trees and in the fall, there are hundreds of apples, plums, cherries, and other fruit to pick. My grandma used to have this handy fruit picker which was like a wire basket with wire claws to pull the fruit off with. I found one, complete with a screw-together pole to make it longer at our local farm store for less than $40, and I’ve used it ever since. When the trees get too tall to use it, we prune the tops so they stay short. The trees are standard trees, meaning they could get 30 feet tall, but with judicious pruning, they grow out instead of up. I can pick safely from the ground with the picking pole. Tree nuts are harvested off the ground in most cases. I remember many family events in the fall where Mom and Dad would drive way out into the country, down wild dirt roads, looking for walnuts and shag-barked hickory trees. When we’d find one on the side of the road, we’d all hop out and start filling bags. Well, that was fine when I was 16, but now all that stooping, bending, and crawling about is definitely out. However, I still like nuts. Luckily, someone invented a rolling nut harvester. This is an oval shaped wire basket on a long handle. You just roll it over the ground and the nuts pop in through the wires and stay inside. You can harvest pecans, walnuts, hickory nuts, and more without bending, stooping or crawling on the ground. Many gardening catalogs carry them, and you can find them in many farm and ranch stores. This inexpensive contraption will let you harvest all the nuts you’d ever want in a very short time. It will even pick up fallen fruits such as plums or crab apples. We used to till our garden with a big TroyBilt “Horse” rear-tine tiller, but as our gardens got more numerous and we got older, even that easy-to-run tiller took a lot out of us. We decided to buy a tractor-mounted tiller. Yes, it was costly (around $1,400), but now we can till an acre in less than an hour. For those who don’t have such a large garden, consider downsizing your tiller to fit your physical needs. If we kept a smaller garden, I would trade in my big “Horse” for the smaller “Bronco.” It may take longer to till the garden with a smaller tiller, but it weighs much less and turns easier. If you need something bigger than a hand held tiller, but not quite the size of a tractor tiller, you can get a rototiller attachment for most brands of riding lawn mower. A garden bench at the edge of your garden will ensure that you have a place to take frequent breaks, while a moving dolly makes it easy to transport heavy items. We love our little Mantis tiller. Because it weighs only 20 pounds, it is easy for us seniors to start and handle. But they’re not a sissy machine! I’ve always likened them to a crazed weasel, they dig so furiously. We use them for cultivating around plants, between rows, and even for loosening the soil to dig in fruit trees. I work the tiller around the inside of the hole, then shovel out all the loose dirt. Soon you have a nice big hole for your new tree. When you have a small garden, you might consider a battery operated tiller. While these tillers are not powerful enough for breaking sod or tilling the spring garden after winter, they are fine for all that cultivating and weeding between plants. They also have the additional benefits of being very lightweight and silent. So they don’t break your back or annoy your neighbors. The older I get, the more mulch I find myself using, not only in our vegetable gardens but in the berry patch and even my extensive flower beds. When I was much younger, I read Ruth Stout’s wonderful book, The Ruth Stout No-Work Garden Book, introducing generations to deep mulching with organic material such as straw and marsh hay. We have an acre of main garden by our house and we only weed it by hand once. First we till it completely, then we plant. When the plants are up four or five inches, we till again and weed between the plants with a hoe or by hand. Next we add an 8-inch layer weed-free reed canary grass between the rows and around the plants where appropriate. We won’t have to weed again all summer, except for the occasional pulling of a weak, stray weed here and there. One caution though — only use weed-free and chemical-free hay or straw. Weed seeds, even hay seeds such as timothy, can make future gardening a nightmare. Some hay crops are treated with herbicides such as Grazon to kill weeds but not the crop. These herbicides remain in the manure from animals who have eaten chemical-sprayed hay and also the hay/straw itself, not only killing weeds but also damaging all the plants in your garden. Be careful and ask the grower about any chemicals sprayed on their crops. Not only does mulch keep the weeds down but it also helps retain moisture around the plant roots, reducing the need for frequent watering. And it breaks down over time. Our mulch is nearly gone by the time we till in the fall and tills in very easily at that time, increasing the tilth of the soil. Where we used to have sand, gravel, and rocks, we now have nice loose black dirt. 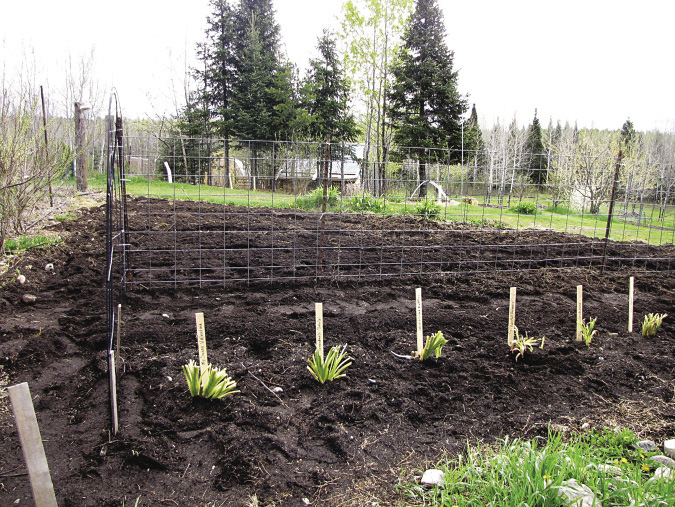 As many folks get older, they begin growing more and more crops in raised beds or containers to reduce the bending and other physical care of the garden. It’s amazing how much food can be grown this way. A friend of ours actually has no garden soil at all; they live on exposed ledge rock. She and her husband garden in five-gallon buckets with drain holes drilled in the bottom, sitting on platforms all around the outside of their deck. In these buckets, they grow tomatoes, carrots, cabbages, onions, cucumbers, beans, and squash. Another friend grows much of their produce in five gallon buckets lined up along the paved approach to their garage. Still another friend uses stacks of large tires and cattle watering troughs to garden in. Even if you don’t want tires or stock tanks in your yard, you can still build traditional square or rectangular raised beds of cedar or other rot-resistant wood. 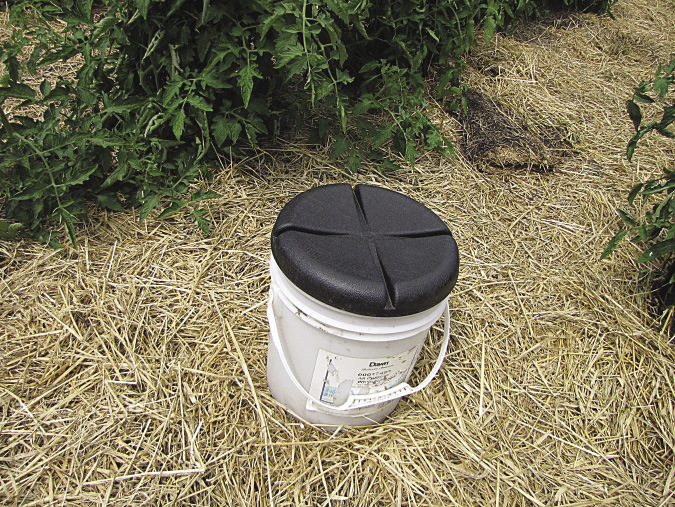 One of my favorite garden helpers is this simple plastic seat which fits into the top of a five-gallon bucket. My husband is making a gardening table for one of our sons who is wheelchair bound, by bolting half of a 55-gallon plastic barrel to a sturdy framework of 2x4s. It will be just high enough for him to access easily from the wheelchair. One of my big annoyances was the grass which grew up along our raised beds in our house garden and the raised beds in the front yard. We do have a gas-powered string trimmer, but that darned thing is hard for me to start with a bum shoulder, and I hated to ask Will to do that puny job every time the grass grew up too high. Finally, I bought a cheap, battery-powered string trimmer. I wasn’t expecting it to work that well, but it whacks grass and weeds nicely and I can work for quite a long time before having to recharge it. This trimmer is lightweight, quiet, and easy to use. One of my nicest garden tools is my Cobrahead hoe. This sharp, oval-shaped hoe is like a flat tooth on a swan-neck, attached to a long handle. I can easily reach and hoe weeds from way under my perennial plants, dig up a dandelion or thistle or make shallow rows to plant carrots. Planting new seeds can really be a back breaker, but I made myself a handy tool to allow me to precisely place seeds all while standing. I took a three-foot-long piece of 1-inch PVC pipe and attached a small funnel to one end. The small end of the funnel feeds into the pipe. I glued a seed cup to the pipe near the funnel (the cup is just a pop bottle with the top cut off). Now, after making my row with a hoe, I place seed in the cup then just walk slowly down the row, placing the end of the pipe into the furrow and dropping one seed at a time into the funnel. It travels down the tube smoothly, making perfect placement of the seeds possible without bending over at all. I think one thing which keeps older folks from gardening more is simply attitude. You know, the “I’m too old to do that” mentality. Yes, some things get harder as you age; that’s a fact of life. Arthritis, muscle pain, and old (or recent) injuries all take their toll, but when you don’t just give up and quit, the rewards are terrific. Even my Mom was actively gardening from a walker in her early 90s, despite terrible rheumatoid arthritis. I’m convinced gardening is one of the best forms of exercise going. Just don’t over do things while keeping your body moving and your mind active and happy. No matter what type of gardening you do, there is always some form of stretching, bending, and moving involved. All of these are good for us, but tiring. Put a bench down by the edge of the garden like I do. Work awhile, then go sit down. Repeat several times and it’s amazing how much gets done. Instead of quitting gardening because it has become too hard, try to figure out ways to make it easier. If parts of gardening are simply too hard no matter what you try, hire the job out to a neighbor. It won’t cost much and will let you continue gardening even longer. Better yet, interest your grandchildren or neighbor children in gardening early on and hire them to help with the heavier jobs. That’s a win-win situation as you’ll be passing down a priceless life skill to a younger generation — a worthy goal for a gardener of any age. Jackie Clay-Atkinson lives with her husband, Will, on their homestead in northern Minnesota. 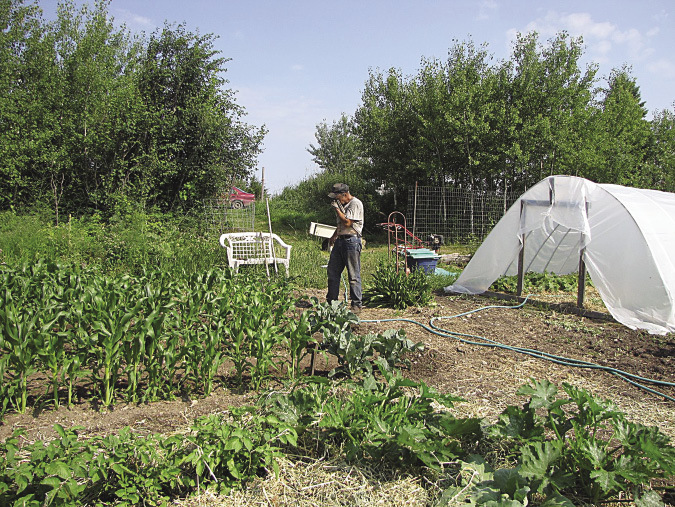 She has spent a lifetime gardening, raising livestock, preserving food, and developing productive homesteads in Montana and New Mexico in addition to her current location. She has written countless articles and numerous books.